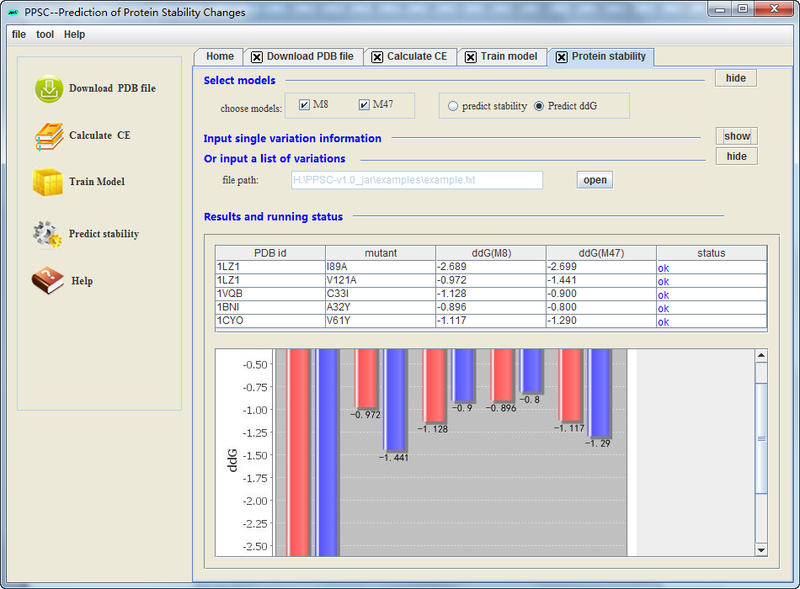 Prediction of Protein Stability Changes (PPSC) is based on M8 and M47 models developed to utilize 8 and 47 features, respectively, in a support vector machine optimized with experimental data. PPSC predicts the effect of protein variation stability. 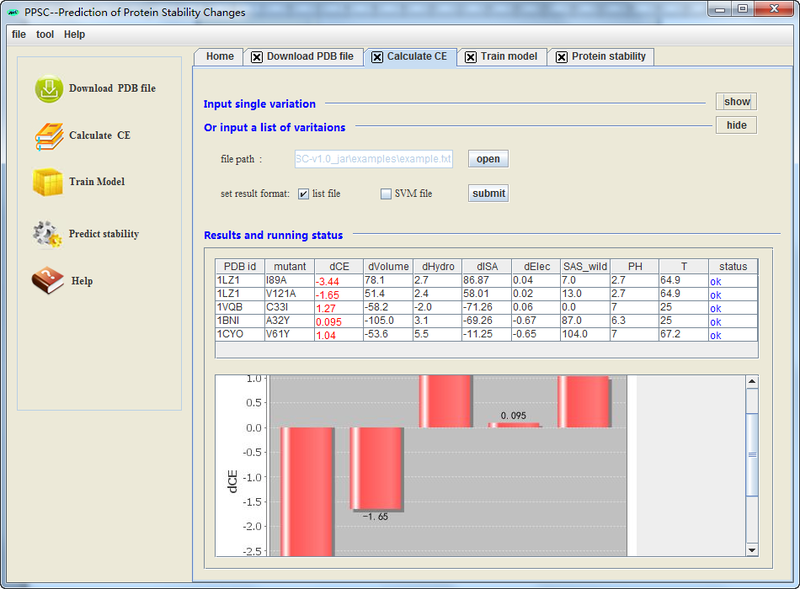 PPSC has four main panels: download PDB File, calculate contact energy (CE), train model, and predict stability change. 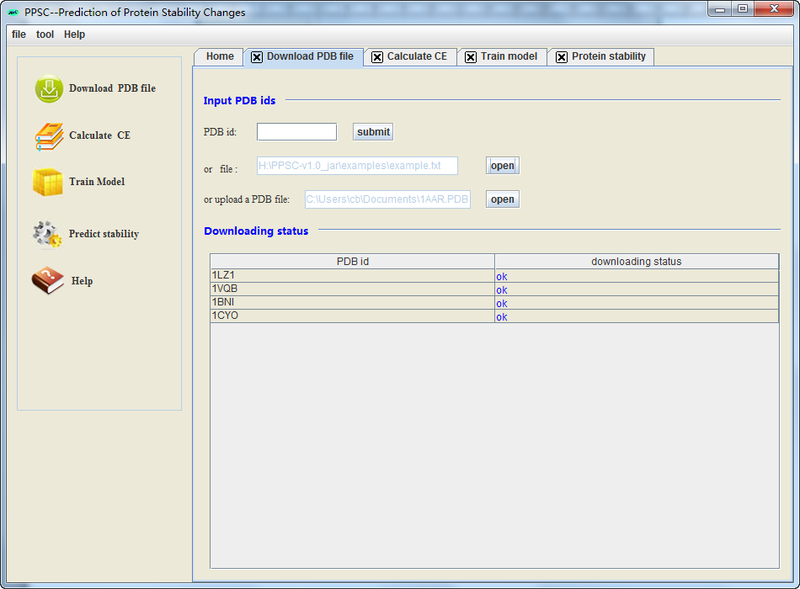 As PPSC is trained with protein structures, PDB file has to be downloaded. The function of “calculate CE” is to calculate CE value, because CE value is one of the input attributes. The program can calculate effects for one or many variants by uploading a batch file. The results of the calculation are displayed as tables or image files. The function of “train model” can be used to train a new SVM model with user defined. In the work, four datasets , S2760, S1810, S1948, S388 , were used for model training and testing All the datasets were extracted from the ProTherm database (Bava, Gromiha, Uedaira, Kitajima and Sarai, 2004, Gromiha et al., 2002). The criteria for the data selection were as follows: (1)	only single point mutations, (2)	the protein structure is available in Protein Data Bank. We extracted seven attributes for each record, i.e. the PDB identification code, the protein name, the amino acid mutation, the Gibbs free energy change value (ΔΔG), pH, temperature, and the solvent accessibility of the mutated residue. After further data filtration and processing, we averaged ΔΔG based on several experimental measurements for a single mutation. Finally, we had 2760 mutations affecting 75 proteins, with 1887 negative and 873 positive cases, respectively. A positive ΔΔG value indicated that the mutation was stabilizing whereas a negative ΔΔG indicated the destabilizing effect of a mutation. The dataset was referred to as S2760. Mutations with associated ΔΔG between 0.5 and –0.5 kcal/mol were classified as neutral. We extract S2760 using |ΔΔG|>0.5 kcal/mol to produce a dataset known as S1810. This dataset contained 1810 mutations affecting 71 proteins, with 1388 negative and 422 positive examples, respectively. Yang Yang, Biao Chen, Ge Tan, Mauno Vihinen, and Bairong Shen, 2013，Structure-based prediction of the effects of a missense variant on protein stability. Amino Acids. 44(3): p. 847-55. This server and its associated data and services are for research purpose only, not for clinical or commercial use. It is a non-profit service to the scientific community. The responsibility of Center for Systems Biology, Soochow University (China) and IMT Bioinformatics (Finland) is limited to applying best efforts in providing and publishing good programs and data. The Center for Systems Biology, Soochow University (China) and IMT Bioinformatics (Finland) have no responsibility for the use of results, data or information which have been provided through this server. In preparation of this site and service, every effort has been made to offer the most current and correct information possible. We make no warranty, express or implied, as to its accuracy or that the information is fit for a particular purpose, and will not be held responsible for any direct, indirect, putative, special, or consequential damages arising out of any inaccuracies or omissions. Individuals, organizations and companies which use this service do so on the understanding that no liability whatsoever either direct or indirect shall rest upon the Center for Systems Biology, Soochow University (China) and IMT Bioinformatics (Finland) or any of their employees or agents for the effect of any process, method or product or that may be produced or adopted by any part, notwithstanding that the formulation of such process, method or product may be based upon information provided here. Copyright (C) 2012 Center for Systems Biology, Soochow University. All Rights Reserved.